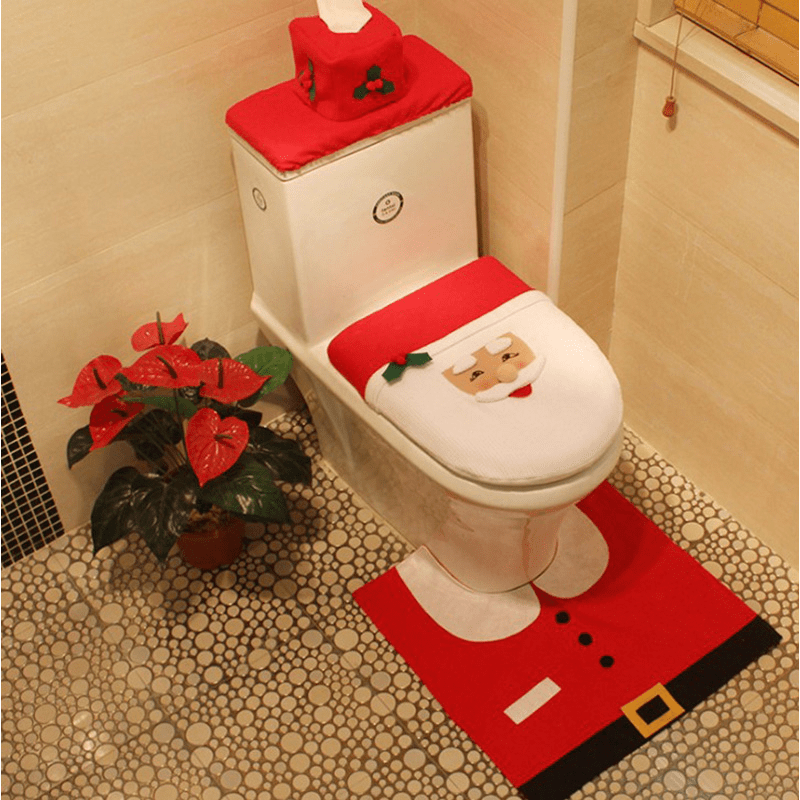 In this article we will discuss about 7 ideas of how to decorate a small bathroom for Christmas. Have you ever had the thought to decorate your bathroom? 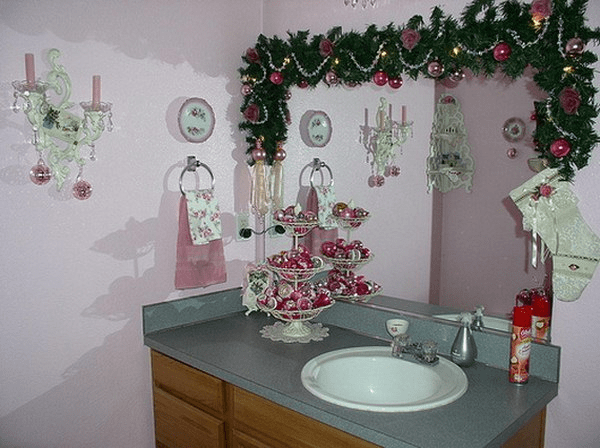 Well, Christmas is the day where everything should be given adorable decoration, including your bathroom. The first thing that you can change from small bathroom is the curtain, the towel, and the mat. For the curtain, you could purchase a white and red curtain with fade patterns of snowflakes, giving your bathroom with another view. To balance the color, you may want to change the towel and the mat too. Find a mat and a towel with same color will create a small Christmas atmosphere in your bathroom. Who says that a Christmas tree could not be put I the bathroom? Of course it can! It is even better if you combine it with idea number 1. Just do not forget, pick the small ones. You can put it in the sink near the tab, or on the windows, or maybe you can just put it near your bathtub. Just put it everywhere you think is right, it will give great scenery in your bathroom. Where do you usually put your toothbrush? Is it in a mug? If yes, then change it. Change it into other toiletries with the shape of Santa Claus or Christmas tree. This way, your toiletries would match with decoration number 1 and 2. To combine ideas from number 1 to 3, the next thing that has to do with red and white color is your toilet seat cover. Do not let it be bland, put on a nice toilet seat cover with Santa Claus pattern. 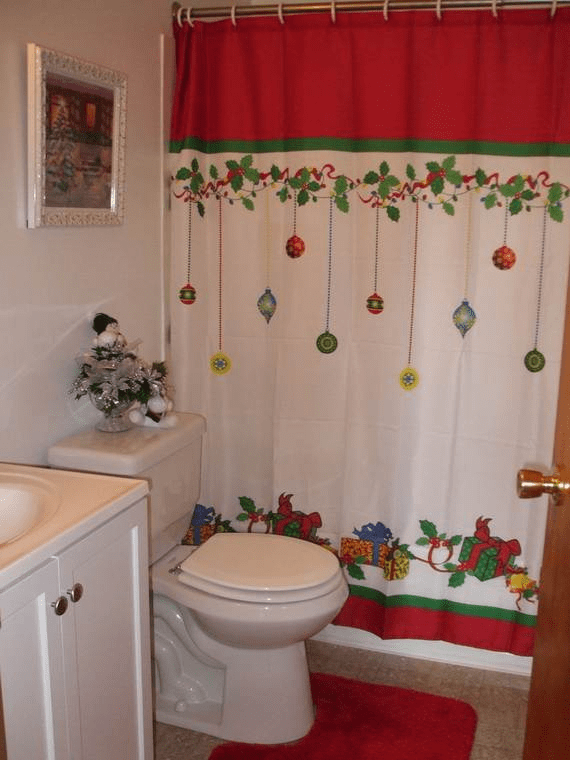 This way, your bathroom has enough decoration to present Christmas. You don’t have to have a furnace in your bathroom to hang socks, do you? Forget the red color, we have enough of it. Now, hang socks with white or other bright, natural colors like cream and beige on your bathroom wall. Do not hang a lot of them or your bathroom would look narrow. Who doesn’t like Christmas figures for decoration? Put it anywhere you like. But, remember that you don’t want your bathroom to be narrow so make sure to minimize it. 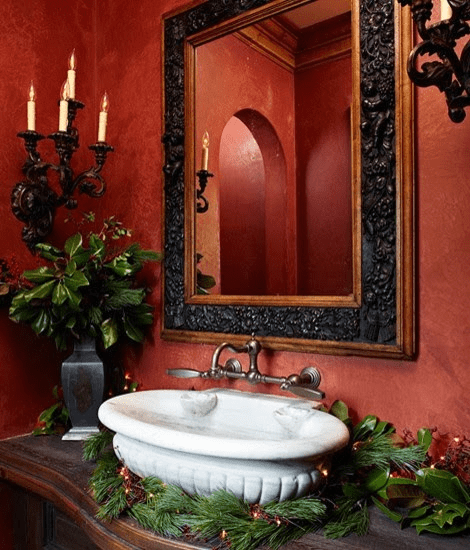 Figures like Santa, his deer, and angels are the usual ones, but using other Christmas-themed figures from a cartoon or other television character would add a nice variety to your bathroom. From what mentioned in number 1, the curtain has a snowflake pattern on it. Hanging snowflakes that you made from Styrofoam and glitter on your ceiling would give a great combination with idea number 1. Just make sure to prevent your bathroom looks narrower by making them into a perfect size and numbers. 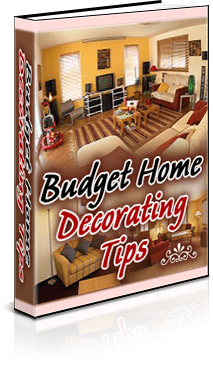 Small bathroom can be tricky to be decorated adorably if the size and the numbers of the decorations are not perfect. Everything has to be calculated and measured so it would not look narrow. But when all that has mentioned above is done, the view in your small bathroom would be merry and beautiful.